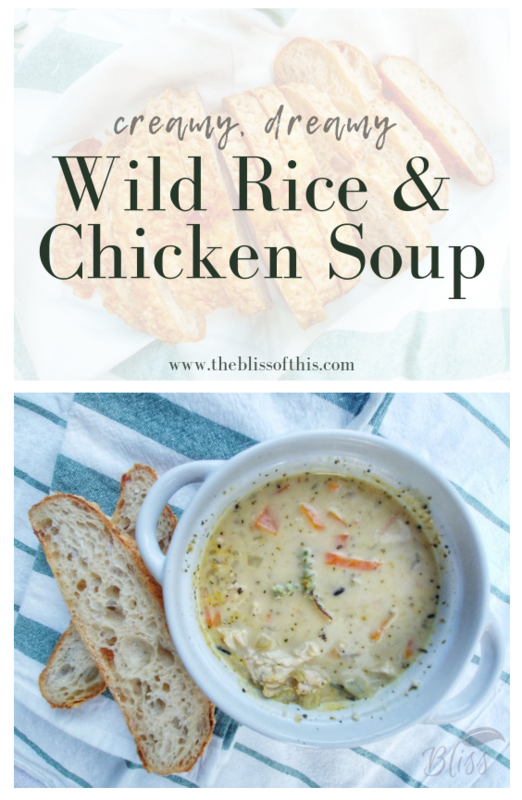 Hearty Wild Rice and Chicken Soup - The Bliss of This Please note this post may contain affiliate links. These mean I make a small commission for recommending great products- there is no additional cost to you. Please see the disclosure page for more information. With the days becoming crisper and shorter, it seams soup season is rapidly approaching. 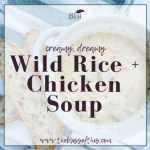 This creamy, dreamy Wild Rice and Chicken soup will help you accept the changing seasons more willingly… because ready or not, here it comes! Not only is it the perfect balance of chicken and cream; the wild rice adds just the right amount of nuttiness to create a soup that will have your taste testers begging for more. Good friends share good recipes… better friends help them fix them until they are perfect. A HUGE shout out to my great friend Deanna for helping make this recipe as great as it is. Not only did she blindly try it out; she fed it to a whole crew of apple pie makers gathered for a school fundraiser. Brave heart that one is. Her bravery turned into her phone popping texts and messages all afternoon as more and more ladies asked her for the recipe. 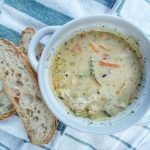 I encourage you to give this soup a try, and leave a loving comment for Deanna- she’s the one responsible for the changes that made this soup the pot of gold that it is! A quick note about the rice. Wild rice (associate link) is not like your typical short grain white. It’s nutrient profile is far more impressive, and it’s flavor much deeper and nuttier. When cooked, it still lends a chewier texture than traditional white rice, making it perfect for soups. I use a wild rice blend for this recipe- it prevents the soup from turning purple (as it would if you used straight wild rice), and tastes great! The cost too is a bit different than white, but trust me it’s worth the extra for this recipe. Minced Garlic – not every garlic is created equal. One teaspoon of this minced garlic = 2 garlic cloves! There’s 76 cloves in a single jar! Italian Seasoning – I actually use an Italian Salad dressing mix as my Italian seasoning! You might like this low sodium blend! Chicken Broth – Keeping cartons of chicken broth in my home just doesn’t happen. My kitchen is about the size of a closet, so I prefer dry mixes that I can add the water to myself. This blend is not only a space saver, it has the added benefit of B12 vitamins too! I’d really love to hear what you think! Comment below to share if you loved it too! Looking for more great recipes and ideas? Sign up for email updates! 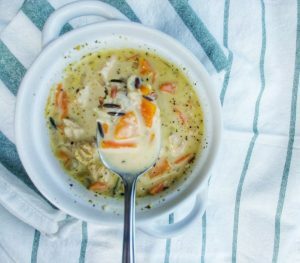 This creamy, dreamy Wild Rice and Chicken soup will help you accept the changing seasons more willingly. 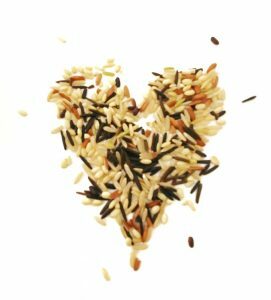 Not only is it the perfect balance of chicken and cream; the wild rice adds just the right amount of nuttiness to create a soup that will have your taste testers begging for more! In a heavy bottom pan over medium heat, melt butter. Add celery, carrots, and onion, and cook until they begin to soften: about 7-10 minutes. Stir in flour. Continue stirring for 1 more minute. Gently stir in chicken broth, garlic, Italian seasoning, bay leaves, and salt and pepper. Add wild rice. Cover, and simmer for 20 minutes, stirring occasionally. Add chicken breasts. Cover and simmer for an additional 30 minutes. Simmer, stirring occasionally, until rice is tender- approximately 10 minutes. Add cream and milk at end of cooking, simmer slowly until heated through. So I just had my first bowl of this. Don’t tell my mom but this might just kick her famous chicken soup out off the top of my favourites list. The rice I used has a lot more dark coloured rice grains in it, so the soup went kinda purple. But what it lacks in appetizing appearance it makes up with a little bit of kick and so much flavour your tastebuds don’t even know what to do with themselves. Soooooooo good. To stay up to date with more recipes and ideas, feel free to sign up for emails below. Wahoo! So glad you loved it Chrystal! Thanks for taking the time to write a review! If you have too many leftovers you can freeze it too! Enjoy! That’s my plan for tomorrow! —so many turkey leftovers! Don’t worry about the bay leaves, I’m sure it will be yum without 😉 Thanks for taking the time to comment! Just tried this today…WOW! So good! Thanks Jackie! Glad you enjoyed it! Thanks for stopping by! Yay! So glad you loved it! I used the blend from Costco (https://amzn.to/2ELVeDN) – it’s a blend instead of just the wild rice, so it keeps it from going purple 😉 smart to rinse it though! Made this soup today after my bestfriend Ashley recommended it. I loved it! So much flavour! I used half and half cream since i didnt have full cream on hand and a brown/wild rice blend instead. I will be making this again! Thanks for sharing this. Looking forward to more recipes!